When it’s time to update the master bath, don’t settle for anything less than WOW. From the crushed glass accent tile to the custom radius glass shower enclosure, this bath is a much deserved luxury for every-day use. 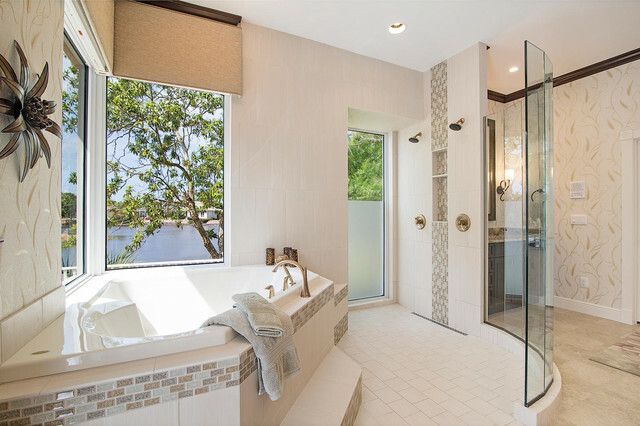 Removal of an existing steam shower and oversized tub allowed for a more open and spacious design incorporating optimal water views. The richness of the dark cabinetry contrasts with the lightly textured tile. Custom designed front lift storage cabinet allows easy access to grooming supplies. Blown glass light fixtures provide a beautiful sparkle to the space. Relax in the corner whirlpool tub and just watch the world go by.